The backbone of your business is your network. We use Open Source software and time tested deployment methods to deliver a stable, affordable, secure, and scalable infrastructure. 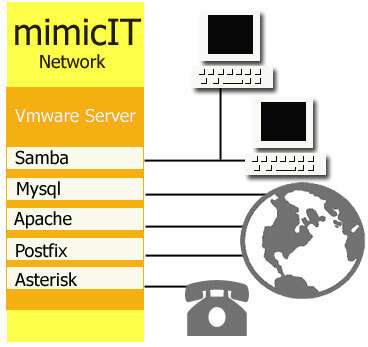 mimicIT uses the newest information technology innovations to get the most bang for your buck. Linux Debian: The debian distribution is the base for many popular Linux distributions, and is our distro of choice. Vmware: Virtualize your server assets, eliminate useless physical machines, and save money as you scale your business with ease. Vmware server is standard with our deployment. Samba: Samba runs the server side communications with your Windows Xp Professional� clients. It handles all logins and profile storage, as well as storage for client data. Postfix: The mail subsystem is flexible and powerful. You can handle your mail in house or farm it out to an off site host, it's up to you. Apache: The most popular webserver in the world today, and It comes installed with a mimicIT network, standard. Mysql: Mysql is the defacto standard for database systems, and is integrated with Apache for our install. Asterisk: Asterisk is the premier PBX system that can easily handle enterprise environments. By integrating it with your network it can provide connectivity solutions that were, until now, cost prohibitive. Each network is customized for your needs and to insure maximum uptime. Our configurations eliminate spyware and virus infections, make incremental backups, and are completely supportable from remote locations. All of the base technology can be integrated for a streamlined work flow and maximum return on investment.